White roof membrane was installed in new and remodeled areas to reduce the heat island effect. A Retention Area and Bio-Swale designed for storm water management to minimize additional stress to the storm drainage system. No new parking was added. Drought resistant plantings, native to Michigan, were used to eliminate the need for an irrigation system. New high efficiency unit HVAC units were purchased for the addition and the remodeled areas. Bike racks were added and carpool spaces were designated to encourage alternative transportation. The new bathrooms have showers for those who need them after riding their bicycles to the building. This also supports TKA’s Housing the Homeless efforts by giving the participants a place to shower. Interior paint finishes and all caulking and sealant materials contain low or zero volatile organic compounds (VOCs). New furniture (classroom chairs), are low VOC and made from recycled plastic. New mechanical, electrical and plumbing systems are high efficiency and automated to limit energy consumption and potable water usage. Many lights have occupancy sensors. Most of the new appliances used in the office and classrooms are Energy Star rated. All or most of the office and other administrative furniture was reused or donated. New carpet in the education wing as well as in the remodeled social hall is made from recycled materials. Carpet tiles used in the social hall make cleaning and replacing carpeting, if needed, more efficient and less wasteful. 33%: estimated electricity savings from using light switches with occupancy sensor controls and efficient HVAC equipment. 35%: amount of recycled materials used in toilet partitions, up to 60% recycled materials in other washroom accessories. 82 tons of construction waste was diverted from landfills (83% recycling rate). 100%: amount of steel from recycled sources. 75%: amount saved in lighting energy for each compact fluorescent (CFL) or LED used in place of an incandescent bulb in desktop lamps and recessed fixtures. 25%: amount saved in lighting energy for each “T8” fluorescent bulb used in place of “T12” in overhead lighting fixtures. Most materials were manufactured and transported to Temple Kol Ami from less than 500 miles away. This kept the carbon footprint and the emissions used to transport these materials here low. This also supported local suppliers or those from neighboring states. All steel and steel products were manufactured within 500 miles of the site. Most of it used recycled materials from pre and post-consumer waste. All concrete supplies came from less than 200 miles from the site. Temple Kol Ami is very proud to set this prestigious example of Tikkun Olam (Repairing the World), and provide a healthy classroom experience for its religious school students and their teachers. Thanks go out to the general contractor MICCO Construction, to the architect Redstone Architects, and to the LEED Project Administrator Newman Consulting Group, for making it possible for Temple Kol Ami to receive this prestigious award. 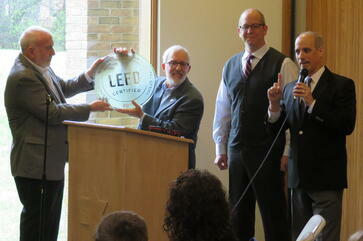 Photo: Rabbi Norm Roman (L) accepts the LEED Certified placque from Jim Newman, Newman Consulting Group. John Claycomb of MICCO Construction and Paul Gross, co-president of Temple Kol Ami also participated.